This is an encore broadcast of part 2 of the interview with Scott W. Berg, it was originally aired in October of 2013. 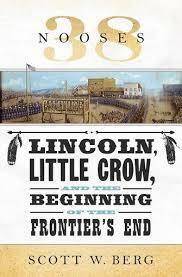 In his book, Scott W. Berg tells the compelling tale of the Dakota War of 1862 and its complex ties to the Civil War, which was happening at the same time. Now out in paperback, 38 Nooses also details the fascinating story of Abraham Lincoln and his personal and surprisingly deep involvement in the judgment of more than 300 men condemned for their role in the Indian uprising. The result was the simultaneous hanging of 38 Dakota men in the largest government-sanctioned execution in American history. On last week’s show, we discussed the major events of the Dakota War, including how Lincoln’s action to personally sign the execution orders for the 38 Dakota men is now viewed through the long lens of history. Today, we’ll talk more about the conflict and about some of the fascinating personalities that Mr. Berg describes in his book. Mr. Berg teaches nonfiction writing and literature at George Mason University and he is a regular contributor to The Washington Post. History books are full of stories about the dangers and deprivations endured by soldiers who fought in the Civil War. What may be less well known are the challenges faced by journalists of the day who risked everything to get to the front lines of battle. This interview with Isabel Wilkerson was originally broadcast in October of 2014. For decades after slavery ended, African Americans continued a mighty struggle against a caste system grounded in racism. Pervasive discrimination kept many blacks from building decent lives in the southern states they called home. Faced with few choices, they undertook one of the largest migrations in our nation’s history, with more than 6 million making their way to Midwestern, Western and Eastern cities between 1915 and 1970.